Habitat builds strength, stability, and self-reliance through shelter. Every person, church, business, and organization can partner make a difference that lasts. There are many ways to partner with Habitat, but there is only one goal. 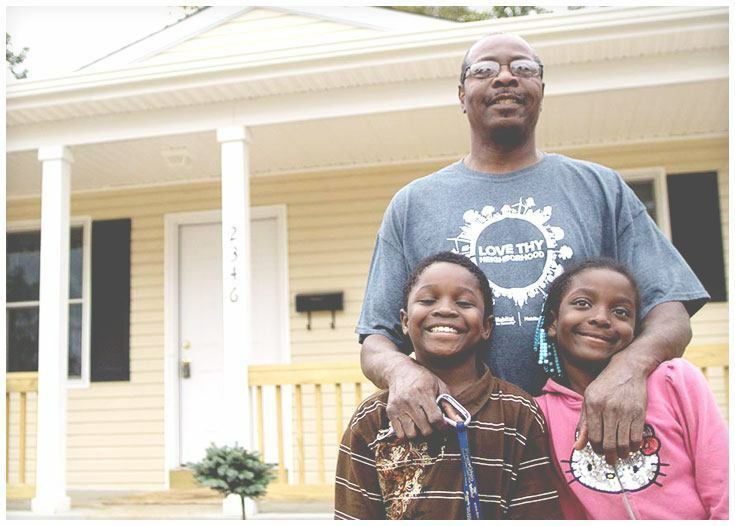 At Habitat for Humanity, we bring people together to offer families and individuals the opportunity to build and purchase their own decent, affordable home. And while there are many ways to join that effort, the goal is the same: offering hard-working families strength, stability, and self-reliance. If you’d like to learn more, we’d love to speak with you. When you partner with Habitat, you’re offering a hand up, not a hand out. Habitat for Humanity homes are not given away. They are sold to hard-working east central Ohio families in need of decent, affordable shelter. Habitat works because of home sponsorships that help families and children discover the strength, stability, and self-reliance we all need and deserve. 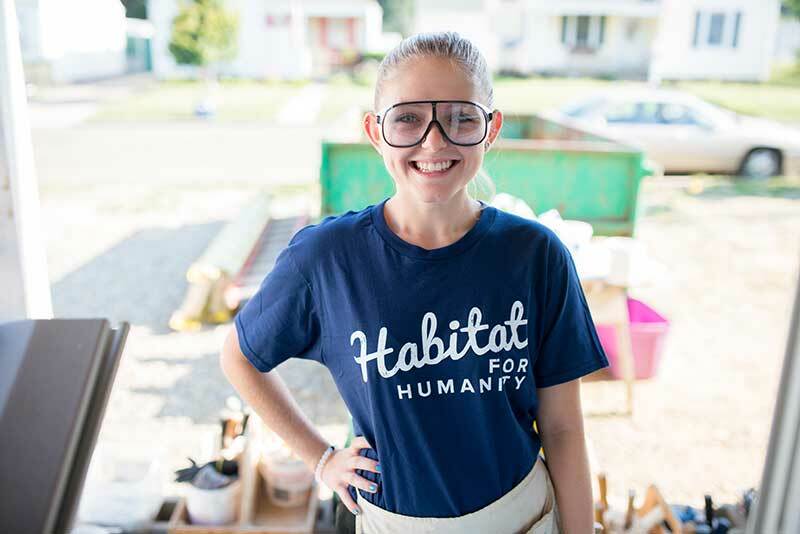 There are many ways you, your company, your church, or your organization can partner with Habitat for Humanity to make a real difference and a tangible impact. We can combine your financial and volunteer support with homeowner house payments, proceeds from Habitat for Humanity ReStore, and the efforts of other home sponsors to create a sponsorship package that works for you. Below are a few different options available for home sponsorship, but if you don’t see an option that fits your situation, please contact us. Every day, we’re working to bring people together to build homes, communities, and hope – and we would love to partner with you. Your Build-A-Home sponsorship builds a home from the ground up. Fully sponsor the construction of a new home and provide all of the volunteer labor. Make a substantial contribution and provide volunteer labor on five days. Contributions are matched with foundation monies. You provide half of the labor. Make a substantial contribution and provide volunteer labor on three days. Renovating an existing home for affordable housing and revitalized neighborhoods. Demolish a blighted property for green space or for use as a future build site. A partnership with us can be customized based on your organization and resource. Community partnerships reshape the community. There are thousands of local families in need and every day we’re helping more area neighbors become homeowners. But we can’t do it alone. It takes a lot of people, money, and prayer to create a simple, decent place to live. Without partnerships with like-minded individuals and organizations, the remarkable community transformation we witness day in and day out would not be possible. Together, we can offer hardworking-local families and individuals hope and the ability to turn their hard work into a simple, decent place for their families to live. If you have a question or would like to speak with us, we would love to hear from you. Our corporate sponsorship program invites and challenges corporations to demonstrate civic leadership and join us in our mission to help all people have decent, affordable shelter. Discover a real return on investment. Corporate partnerships make a tangible difference in our community and offer a wealth of benefits to corporations, including tax deductions, beneficial community relations, and a permanent positive effect on company morale. United around the goal of helping those in need, employees at every level get to see each other at their best on a Habitat build. It’s an opportunity to grow, to bond and to experience the positive effects that are carried back to the workplace. Bring your team of employees, clients, or customers and join us for a day of volunteerism on a Habitat site. Your company provides volunteers and/or a financial contribution, and we provide skilled construction supervision, training, tools, and safety equipment. Our belief is that all people should have a safe, decent place to live. As an ecumenical Christian ministry, we invite people of all faiths to join our calling to build and renovate simple, decent, affordable houses. Let’s put our faith into action… together. 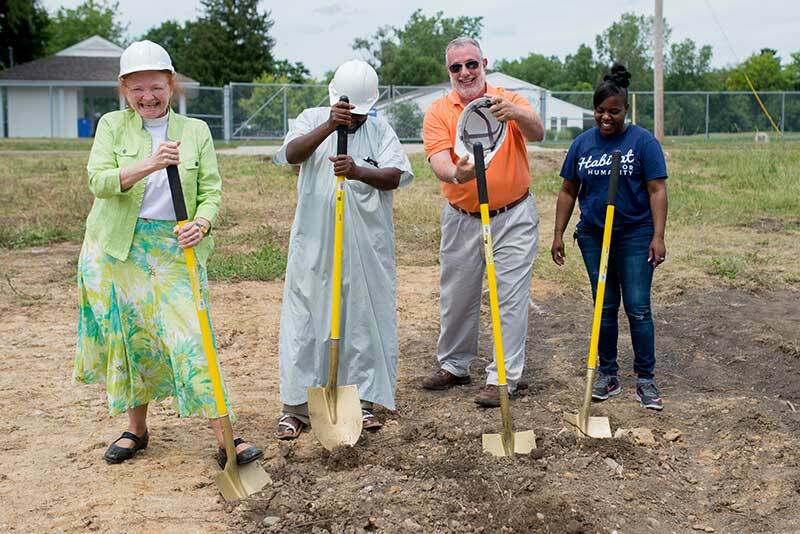 At Habitat for Humanity, our faith drives our mission: to put God’s love into action by bringing people together to build homes, communities, and hope. This mission is about tearing down walls and building bridges. It’s about offering hope and transforming lives. It’s about serving God by serving others. What other ideas can you discover? With their special energy, enthusiasm and creativity, youth and education groups can play a unique role in Habitat’s mission to eliminate poverty housing and create awareness of the need for safe and affordable housing. No matter the age, everyone can make a difference. Youth and education groups can play a unique role in Habitat’s mission and create awareness of the need for decent, affordable housing for all people. Working with Habitat lets volunteers gain first-hand knowledge about issues of affordable housing and provides them with the opportunity to work toward a solution. They also learn new skills and develop a life-long spirit of service at the same time. We encourage youth to be involved in any of our group or individual volunteer opportunities. However, certain age guidelines must be strictly enforced: All construction site tasks require volunteers to be 16 years of age or older and at least 18 years of age to be on a roof. There are limited construction tasks that can be done by volunteers under 16, and younger volunteers must be accompanied by adult supervision. Minors must have a waiver signed by a parent or guardian. Disclaimers aside, we really want the enthusiasm and excitement of young people to spread throughout the Habitat for Humanity ministry – and we would love to talk with you about how your youth and educational groups can make a lasting difference with local families in need. When we minimize costs, we maximize the number of homes built and renovated. Donated materials and services are crucial to the success of our organization and greatly reduce the cost of the programs we offer. We will gladly accept donations of building materials, equipment, construction, and professional services, as well as devotion time snacks and lunches for the volunteers on our work sites. Your skills and materials make a difference. If you think that you have a donation that may be of interest, we would love to speak with you about gifts in kind. Contact us today. Ready to discuss a partnership with Habitat for Humanity?